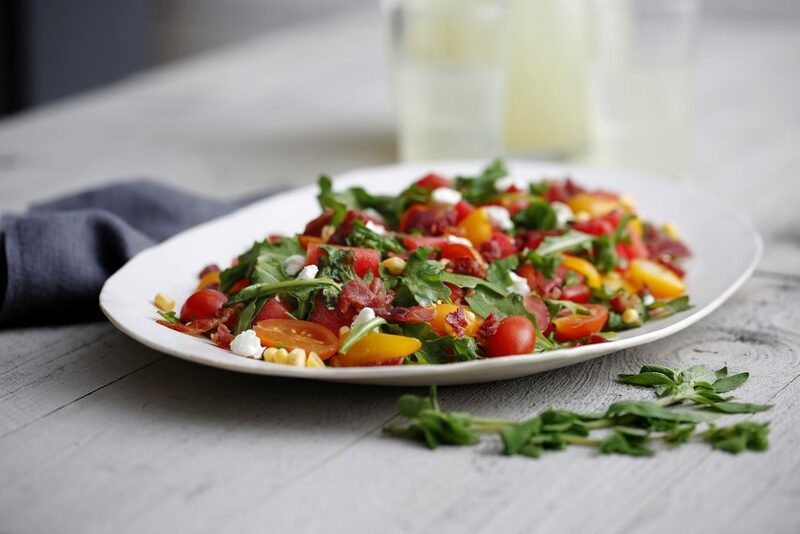 Crispy Prosciutto di Parma adds texture and savory flavor to this summery prosciutto salad featuring watermelon, fresh corn and oregano. This melding of flavors is sure to impress as a side dish at your next barbecue or dinner party. Complement the fresh ingredients in this prosciutto salad, by whipping up a batch of homemade iced tea or lemonade to serve alongside. In a large non-stick skillet over medium heat cook prosciutto until crispy. Set aside. In a large bowl, combine watermelon, arugula, corn, tomatoes and feta. In a small bowl whisk olive oil, lemon juice, oregano, lemon zest, kosher salt and sugar until blended. Toss fruit mixture with dressing until evenly coated. Top with reserved crispy prosciutto.